Alyssa Peek is the owner of Peek Photography, located in New York City. Peek Photography has two divisions – the Personal Branding Division and the Peek Photo Art Division – both orbit around ideas of transformation. Through the Personal Branding Division, Alyssa coaches women over 40 in areas of confidence and presence. Her tool? Photography! Alyssa helps business owners and professional women dismantle limiting beliefs, establish new self awareness, and achieve personal and professional goals. The Peek Photo Art Division is fine art photography that combines theories of abstract art and photography into one medium. Alyssa works closely with interior designers to create custom sized art for clients and a few select home furnishing stores. 6.20 a.m. Wake up early with my husband. He makes me coffee in bed every morning, and if I sleep too late I miss out! I drink my coffee and post on social media. I am not a planner, so I never plan out a month of posts. I am definitely inspired by my mood rather than agenda (probably because I am creative). This can be good or bad, but it works for me. When I share my photos, I always like to include something helpful or inspiring – maybe a story about why my client decided to update her photos or an easy trick to looking great in any picture. There are two parts of my business, personal branding photography and fine art photography, so there are always two sets of posts. 7.00 a.m. Head to the gym. If I don’t cross “workout” off of my list before the day starts, I know it won’t happen. I do cardio and stretching on a regular basis, and throw in weights every once in a while. My right arm gets an all-day workout holding my camera, so I need to make sure my left arm can keep up! I have a friend, Amy, who rides the bike next to me. (Chatting with someone during your workout can really make the time fly by.) If Amy isn’t there, my favorite thing to watch during my workout is…a cooking show! Figure that! I love to learn new recipes, but my favorite is a competitive cooking show. Sometimes I have to stay on the machine a little longer just to see who won! 8.00 a.m. I come home, check emails, shower, and make breakfast before heading out to a photoshoot. Between moving props and lugging equipment, a shoot is physically demanding! A hearty breakfast is definitely necessary. My latest kick is scrambled eggs with avocado and fresh parsley. Yum! 9.00 a.m. Time for a pre-shoot consultation with my client. Before a photoshoot session, I meet with my client via Zoom or Skype to review outfit selections and address any questions she may have. By this time, she has already received and reviewed my “How To Prepared Guide,” full of tips and tricks (including which styles and colors look best on camera). That way, when we are on the call she already has a few outfits ready for review. We discuss if the looks have met the right criteria for a successful photoshoot, and if not, we look through her closet together virtually. She tries on her outfit so I can see the fit and make sure she will get the most out of her session. Styling for a photoshoot is not the same as styling for life. The camera sees things differently! 10.00 a.m. I leave for the studio, located in midtown. I have always been a subway girl – I spent years trudging up subway stairs with a camera on my back and a backdrop over my shoulder, and after living in NYC for 28 years I know the quickest way around town is the subway – but, this year, I have decided give up SCHLEPPING! I am 50 years old, and my body can’t take the weight on my shoulders anymore. Welcome, 2019! Now I build in extra time for Via (my car service of choice) so I can get to the shoot on time. 11.00 a.m. Arrive at the studio and meet with my client. Today, I’m working with a woman who runs a nationally acclaimed non-profit and wants to elevate her online presence. We unpack the clothing, lay out her jewelry, and decide o the first and final outfits of the shoot – this also helps the makeup artist coordinate colors and plan accordingly. Now, she is ready for her makeover! The stylist discusses the look the client is trying to achieve and reviews any “favorite photos” of herself she may have brought along. After hair and makeup are complete, we are ready for the shoot! All sessions start with a quick photography tutorial – the “do’s and don’ts” of making a great photo – and I explain some basics of how a camera works. The shoot is definitely a dough-kneading process. My goal is to make my client feel relaxed and comfortable in front of the camera. Since I do not work with models, these women (who are confident in their business, but maybe not in front of a camera) need massaging. They need time to let go of their fears, and when they do, it is so much fun! Dancing, twirling, laughing…it’s a special time when they can finally let their inner child come out to play. Get in tune with their true essence. This is what I love about what I do. It’s not so much about the headshot, as it is about helping my women fall in love with themselves all over again. 1.30 p.m. I grab a bite to eat. My go-to spot is Pret-A-Manager. I know what I’m eating is fresh and healthy…but of course I always have to add on a chocolate chip cookie (fresh out of the oven). 3.00 p.m. I head downtown in my Via to a meeting with an interior designer. She calls my box of samples “The Magic Box,” since she has had so much success using it to selecting art for her clients! She shows me the colors and materials of the project, we discuss the custom sizes needed, and she starts to pull samples. 4.15 p.m. Time to head home! I go uptown to drop off my gear and rest. “Rest” consists of downloading images from the morning shoot, editing other clients’ photos, answering emails. and picking up ingredients for dinner. Living in NYC, no two days are the same (especially with my lifestyle!). I always pick up dinner day-of, since I never know what the day will bring or which networking event I will attend. 8.00 p.m. Eat dinner with my husband and watch the news or Netflix. We love murder mysteries! 10.00 p.m. Head off to bed with Don Lemmon (on TV, of course). Psst! 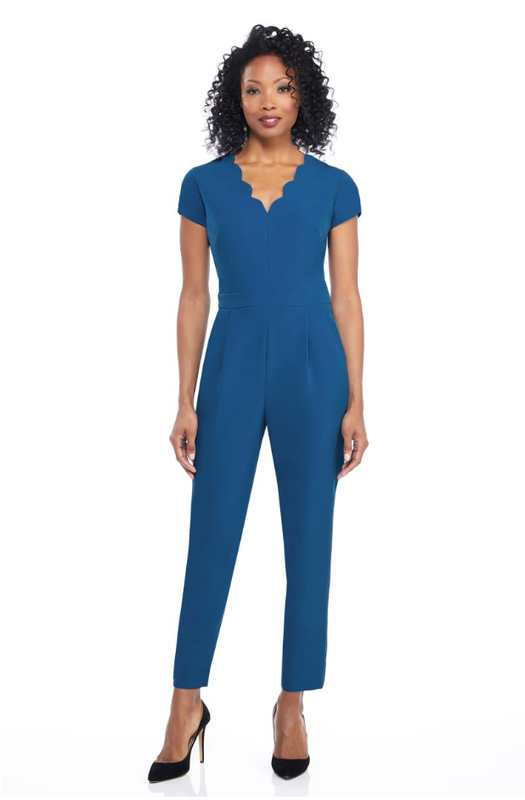 This jumpsuit is also available in Petite sizes.